Plans are being made for a Highland debut in the prestigious Cape Breton Celtic Colours Musical Festival. The proposed visit in October has emerged from the co-operative agreement recently signed by The Highland Council and the Nova Scotia Provincial Government, which aims to encourage exchanges of young people as well establish joint working on Gaelic language and culture; tourism; economic and social development and education. 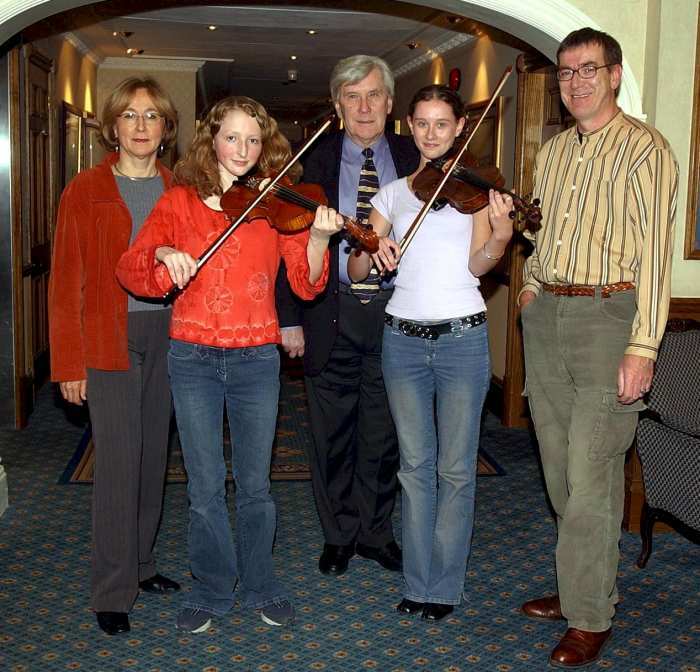 on Gaelic Language and Culture and Feis Rois Fiddlers Catriona Ramsay (left) and Katie Mackenzie (right). The Celtic Colours Festival is a money-spinning event, which showcases the best of Cape Breton traditional music and attracts musicians from other Celtic countries. It runs for 10 days each October. The friendship between the Scottish and Nova Scotian communities was strengthened by the recent visit to the Highlands of Joella Foulds and Max MacDonald, the two directors of the Cape Breton Celtic Colours Festival. They spent some time at the Scottish Centre of Excellence for Traditional Music at Plockton High School and met representatives of the Feis movement, including Feis Rois, during their two-day stay. The discussions centred on the proposals that young people from the Highlands take part in the Celtic Colours Festival and on exchanging ideas for a Highland Celtic Music Festival, which is hoped will be up and running in time for the Scottish Year of Highland Culture. The visit by the Directors of Cape Breton's Celtic Colours Festival was part of an agreed Action Plan outlining where development work could be undertaken. They also met with representatives of the arts, music and cultural organisations in the Highlands. Councillor Allan Beaton, The Highland Council's Gaelic spokesman and Chairman of the Skye and Lochalsh Area Committee, said: "We were delighted to welcome Joella Foulds and Max MacDonald to the Highlands and introduce them to many of our talented traditional musicians and the key people in the arts, music and cultural field. We feel there are many positive areas and opportunities to be gained through partnership, including exchange visits for school pupils, increased tourism, and most importantly development and preservation of the Gaelic language. We would hope that we will be able to send the first Highland musicians to the Cape Breton Celtic Colours Festival in October and gradually develop our participation in this highly prestigious event, which I attended last year. I would like to think we could organise our own Celtic Colours Festival in the not too distant future."